After contributing to relief efforts in Nepal following the four major earthquakes of April and May, 2015, which killed more than 8,000 people, Pratiksha Sharma found she needed to do more to help prevent such a major loss of life in the long-term. As a double major in electrical and computer engineering and computer science, Sharma believed she could scope a project related to her studies that could help the people of her home country. 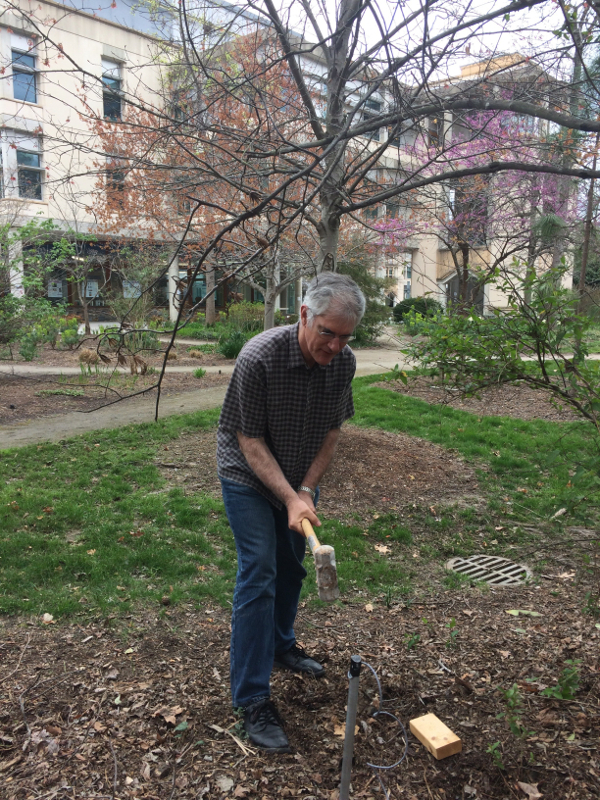 After contacting various professors at Duke, she found Henri Gavin, a professor of civil and environmental engineering who specializes in earthquake engineering. Three years later, Sharma has advanced algorithms designed to detect pressure waves that travel through the Earth’s surface, and has implemented the method in prototype devices. 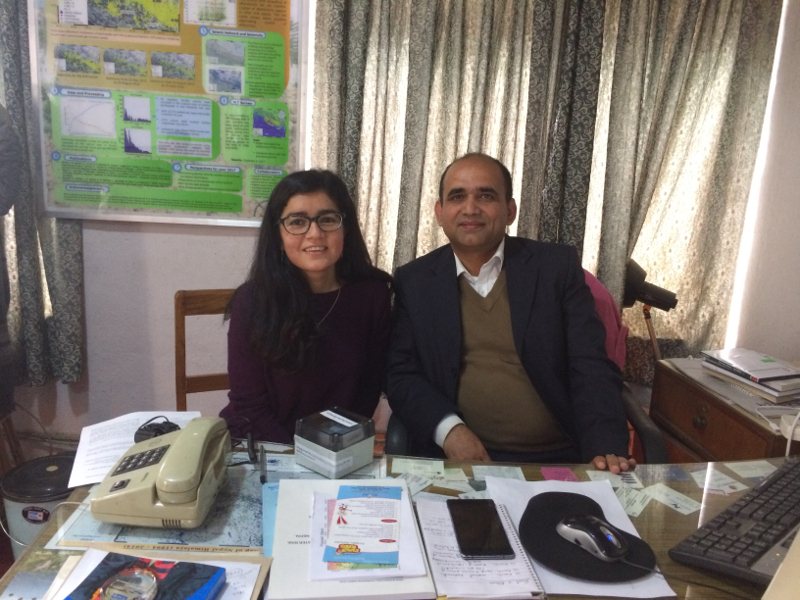 Over spring break this year, Sharma demonstrated her work to Dr. Lok Bijay Adhikari, the chief of Nepal’s National Seismological Center and installed one of her sensors in his office. Just before noon on April 25, 2015, a magnitude 7.8 earthquake that maxed out the seismic intensity scale shook the entire nation of Nepal. Originating about 100 km northwest of the capital city of Kathmandu, this earthquake along with a magnitude 7.1 aftershock on May 12 killed nearly 9,000 people and injured nearly 22,000 more while damaging or destroying more than 600,000 structures. It was the deadliest earthquake in Nepal since 1934. Pratiksha Sharma, who had just finished her freshman year in engineering at Duke, banded together with four other Duke Nepalese students to raise $30,000 in relief funds. They then spent the first month of their summer visiting damaged areas and deciding where the funds should be directed. With the monsoon season quickly approaching, they focused on providing tin roofs to damaged structures in five districts. That’s why Sharma was on a bus to Kathmandu when the magnitude 7.3 aftershock hit. For Sharma and her family, home lies in a relatively flat plain outside of the city. The geography spared their house from major damage, though part of the structure still had to be dismantled for repairs. The experience made Sharma resolve to find a longer-lasting way to help save people from such earthquakes in the future. After finding Professor Gavin the following fall semester, Sharma took his advice that she should work on creating a sensor that could reliably detect an earthquake and alert people living nearby. She wouldn’t have to start from scratch, as one of Gavin’s recent PhD students, Anton Zaicenco, had developed an earthquake early warning system for Vancouver, and had published his methodology. Zaicenco’s approach distinguishes actual earthquakes from electrical noise by computing the polarization of the measurements. Seismic waves propagate in two types of waves called P-waves and S-waves that radiate from their epicenter through the earth. P-waves—or compressional waves—shake the ground only in the direction they are traveling. S-waves—or shear waves— arrive after the P-waves, propagating at about two-thirds the speed with much greater velocity amplitudes, which are responsible for most earthquake damage. It is these faster P-waves that engineers rely on to detect earthquakes. Not only do they arrive at early warning sensors faster, their one-dimensional effects are easy to detect. The technique Sharma decided to use to detect these P-waves relies on a triaxial accelerometer similar to those found in cell phones or fitness watches. A triaxial sensor can detect these disturbances along three axes. The challenging part of using a chip like this to detect earthquakes is in determining if signals coming from the three axes correspond to a uni-directional compression wave. Sharma’s independent study involved the physics of elastic wave propagation and the real-time data analysis used in computing the triaxial polarization of seismic waves. She spent her junior year implementing and testing her data analytics methods in Matlab with records of previous earthquakes. Come senior year, she ported the algorithm to an EPS-8266 microprocessor and an I2C digital accelerometer. And then it was time to put her work to the test. 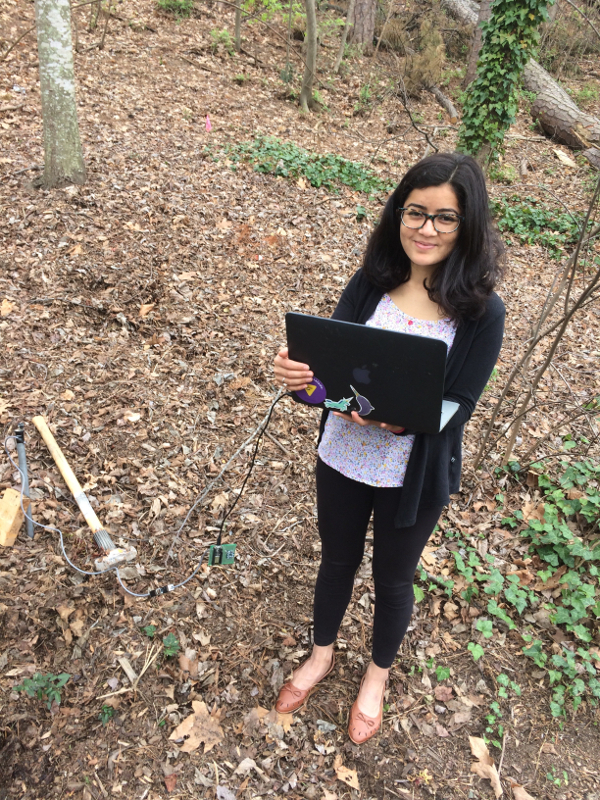 With the difficult technical pieces figured out, Sharma implemented her hardware setup into two earthquake detection boxes and took them to Nepal during the 2018 spring break. One is sitting at the National Seismological Center while the other resides at a nearby radio station to test each in different environments. The latter works so well that Sharma can keep track of the day’s changing traffic patterns as trucks roll over potholes on the roads outside. The former was left as a demonstration for the chief of the National Seismological Center, Lok Bijaya Adhikari. 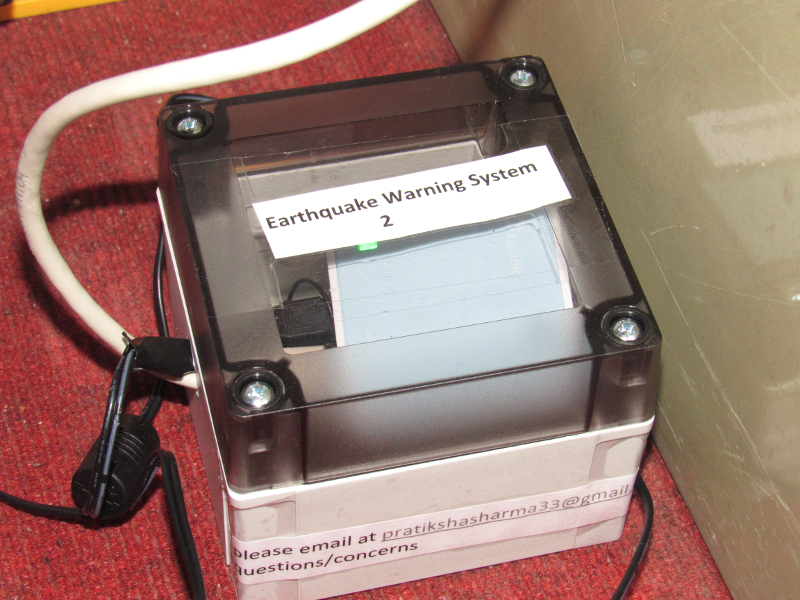 There are logistical hurdles standing between Sharma and her ambition of implementing an early earthquake warning system for Nepal. A true nationwide system will require 200 to 300 sensors spread throughout the country. While the components for the sensors themselves are not expensive, paying people to install and monitor them in remote areas across the entire country would be, and the Nepalese government has many issues vying for space in their budget. There is also the issue of where to place the sensors. Sharma’s idea is to encase the hardware in concrete and bury it a few feet deep with a pole running out to carry the signals to the surface. If the units are installed on the sites of cellular phone towers, they would have access to both power and communications. Getting corporate cooperation for such a plan, however, will require memorandums of understanding, potentially facilitated by both governmental and non-governmental agencies. And then there’s Sharma’s career. After graduating from Duke in May, she will begin working on a technical team for Goldman Sachs in New York City. While she plans to continue pursuing the project, her new job will limit the time she can spend on it and complicate the logistics of talking and meeting with the people needed to keep the ball rolling. But if successful, her efforts would be well worth the trouble. If sensors had been near the epicenter of the 2015 earthquake, they could have detected it up to 80 seconds before it reached Kathmandu. Even factoring in the time it would take to corroborate the signal with other sensors and transmit a warning to everyone’s cell phones—which are just as abundant in Nepal as they are in America—people could have gotten more than a minute warning.